Affiliate marketing is simple to understand, when an affiliate (or sometimes called a publisher) refers a sale to a merchant they receive a commission. The payment can be in the form of a percentage of the sale or a flat dollar amount. There are occasions when affiliates will get paid a “bonus”. The reasons an affiliate may receive a bonus include: being a top performer and the merchant is showing their appreciation, hitting a specific goal outlined by the merchant, paying for placements on affiliates sites, or for some reason their sales not getting tracked and the merchant is manually crediting them their earned commissions. With that being said I will show you how to manually credit a bonus to an affiliate within CJ Affiliate. Once you log in to you CJ Affiliate merchant account you will want to click the “Reports” tab. Here you can review program performance, affiliate performance, promo codes, but we are going to focus on the “Transaction” tab. Once you click on the “Transaction” tab you will be directed to a screen where you can review all transactions that have taken place over the life of the affiliate program. After clicking on the “Transaction” tab you need to scroll all the way to the bottom and click the “Create Commission” button. This is where you will officially pay the bonus to the affiliate. Once the button is clicked a pop-up will appear and will need to be filled out. You want to make sure the “Action Name” drop down box is filled in with “Bonus”. When filling the “Website ID” make sure you are using the affiliates PID and not CID. If you use a CID it will not work. After entering the “Website ID” enter an order number, it can be an internal one or one specifically for CJ, but it is required. 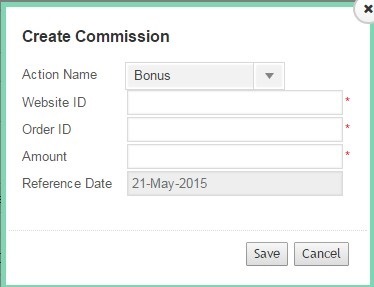 Once that is complete you need to fill in the exact amount you are going to “Bonus” the affiliate. Once all four sections are complete, hit “SAVE”. You will then get a message saying the transaction was successful. This action is not used on a daily basis, but should be understood. It is important for affiliate managers to know how to maneuver the network and credit affiliates when necessary. As I mentioned above there are various reasons this action can/should be used, but knowing how and why to use it is equally as important. Recruiting quality affiliates can be a challenging and time consuming task, so CJ Affiliate has offered their merchants a way to recruit affiliates through their interface. All of the affiliates with accounts in CJ Affiliate can be sent an offer through this function and you, as the merchant, can choose what affiliates you want to partner with. They offer a robust filtering system to narrow your search down to the group of affiliates you want to target. Let me show you step-by-step how to recruit CJ affiliates. Once you log in to your merchant account, navigate to the “Manage Publishers” tab and click. After clicking the “Manage Publishers” tab click the “Publisher Recruitment (beta)” tab, which is directly underneath the main navigation. Searching for affiliates can be done by entering keywords, category, country, network earnings, geographic source, and publisher classification. If you are targeting affiliates in a specific category you can choose that, whatever it may be (i.e. Consumer electronics, Health, Home & Garden, etc). If you want to only recruit affiliates in the United States you have that capability as well. You, as the merchant, have numerous way to filter and recruit affiliates so you can grow your program. Once you have filtered out the affiliates based on categories selected it is now time to send them an offer. The offer can be the default offer or a customized offer for them or other targeted affiliates. You will see the list of prospective affiliates to the right. It will list their ID, URL, network earnings and their classification. If you want to partner with an affiliate listed just check the box to the left of their name (do this for all the affiliates listed) and click the “Make Offer” button. 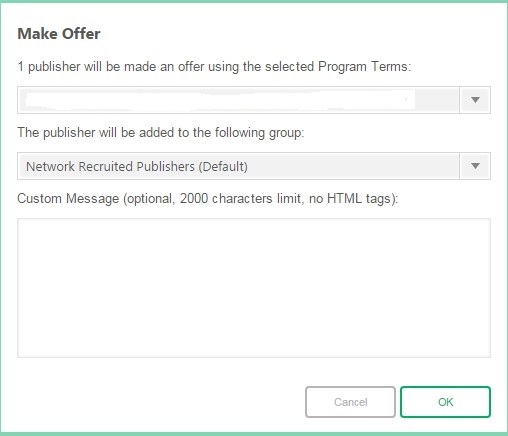 Once you clicked “Make Offer” a pop-up will appear for you to choose the program terms you want to send to the affiliate. If you have more than one program term, then hit the arrow for the drop down box to choose the one to offer them. You can also add them to a group if you want (optional). Once the offer has been selected, hit “OK”. The offer will be sent to the affiliate(s) for them to approve. Please be aware that affiliates may decline the offer you send them, so if they are high on your target list reach out to them personally to see what it will take to work together. After sending the offer we (AM Navigator) highly recommend reaching out to the affiliate(s) individually with an email explaining the offer and links to apply to the program. Using CJ Affiliate to recruit affiliates can be a time saving task, but it should not replace actively looking for affiliates though other sources like: Google, social media, and current customers. Active affiliate recruitment is an integral part of affiliate program management and should be done weekly and follow a strict schedule of follow-ups.